Gestate is an exhibition of paintings that have an ethereal, bodily presence. Romany layers, smudges, and drips paint onto the canvas, creating an illusion of transparency and lightness. The artist, who favors a palette of natural tones, is interested in engaging the history and materiality of the painting process as well as the subtleties of form that lay just beneath the surface. Romany will be joined by a special guest for the May 19 Artist Reception and Talk: Romi Crawford, Associate Professor, Associate professor of Visual & Critical and Africana Studies at the School of the Art Institute of Chicago. 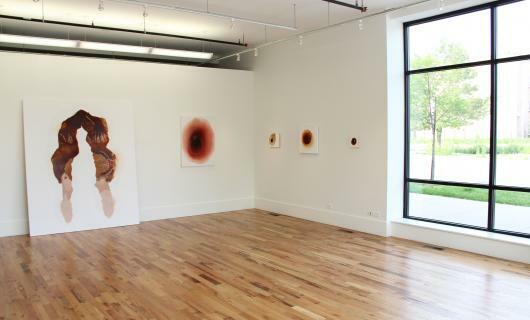 Kellie Romany is a Chicago-based visual artist interested in the materiality and history of the painting process, with a specific focus on the body as a permeable and evolving entity. Romany was born in Trinidad and moved to the United States in the late 90s. She received a Masters of Fine Arts in Painting from the School of the Art Institute of Chicago in 2011, and a Bachelors of Fine Arts from the Maryland Institute College of Art in 2008. Romany has exhibited both nationally and internationally, including Sullivan Galleries in Chicago, Parade Ground Gallery in New York, Amel Bourouina Gallery in Berlin, Germany and Minninger Gallery in Cologne, Germany. Residencies include Albert Oehlen’s Studio in Lekeitio, Spain. Romi Crawford is Associate professor of Visual & Critical and Africana Studies at the School of the Art Institute of Chicago. She was previously the Curator and Director of Education and Public Programs at the Studio Museum in Harlem. Her research revolves primarily around ideas of race and ethnicity and the relation to American visual, aesthetic, and popular culture. She holds a Ph.D. from the University of Chicago and has been published in Art Journal; Cinema Remixed and Reloaded: Black Women Film and Video Artists (University of Washington, 2008); Black Light/White Noise: Sound and Light in Contemporary Art (Contemporary Art Contemporary Art Museum Houston, 2007); Frequency (Studio Museum in Harlem, 2006); and Art and Social Justice Education: Culture as Commons (Routledge, 2011) and Service Media (Green Lantern, 2013).